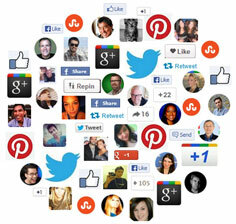 Social Media is an optimal part for businesses to rank top in the search engine results pages. Different firms have started using various relative strategies and one of them is Social Signals. Ranking at the top of search engine results via customer feedback called social signals. This is a modern ranking method and a vital process used by leading organizations. This process is associated with shares, likes, pins, votes as well as views of people given on the social network websites such as Facebook, LinkedIn, Twitter and much more. Apparently, this is an advanced method preferred by several businesses. In order to improve your business and its functions effectively, feel free to contact BSM. We are a modern firm and replete with digitized solutions. With us, you will be provided with the quality social signals that help you to know whether your brand turns renowned among targeted consumers or not? Moreover, this is an effective method to improvise SERP rankings accordingly. Why it is necessary for your business? Due to recent Google’s Panda and Penguin updates, web masters give more focus towards the quality of a website’s content. This raises customer’s feedback and also the need of Social Signals. However, conventional SEO strategies are also being used in order to determine SERP rankings. Blue Swami Media, is dedicated to provide such effective yet modern services for your business. We are associated with a team of experienced web masters who use these latest techniques. Moreover, this is an ideal way to determine ranks through customer’s feedback. Our firm has been providing this advanced solution for many years. You will be facilitated with right services and right outcome as per desired expectations. So, whatever is your requirement do contact us and get desired services within your budget. This is our core concern and duty to serve you with quality solutions. So, call us today on 123-456-7890 ! !